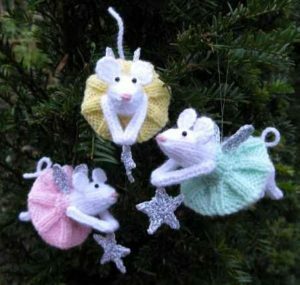 These knitted mice are perfect for Christmas or anytime as presents for young and old! They are adorable and possibly one of the cutest ornaments ever! The design is fantastic and they look so perfect on a Christmas tree! Furry Fairies by Alan Dart is a cute Christmas knitting project you can use to make beautiful gifts for family and friends using left over bits. So simple and cute, this pattern is pure genius! If you need quick little projects, this pattern is just perfect! 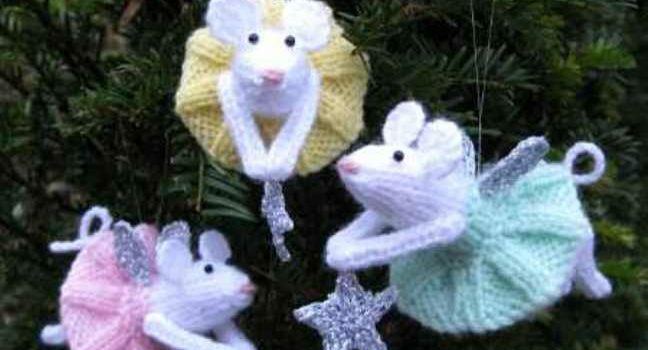 You will need For each mouse: Of Hayfield Bonus DK 100g balls: 10g in White 961, 5g in dress shade (colours used here are Mint 956, Primrose 957, and Iced Pink 958); of Anchor Artiste Metallic 25g balls: 2g in Silver 301; scrap of dusky pink yarn; pair of 3mm (no.11) knitting needles; 5g of washable toy stuffing; two 1/8in (3mm) diameter black beads; silver machine embroidery thread; white sewing thread or clear adhesive; long tweezers; hair spray. Thanks to Alan Dart for the article inspiration and featured image. Super cute but not crochet.